Although you can still buy circular saw attachments, most circular saws these days are integral tools. 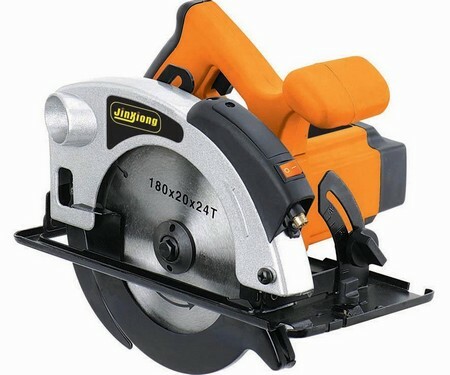 The types of circular saw on the market can be divided roughly into small ones, with a blade diameter of 150mm or less and motors rated at less than 1000W, and large ones with a blade diameter of around 190mm and more powerful motors. Small saws can cut timber up to 40 to 50mm thick; large ones can gener­ally take up to 65mm. Most new saws come with tungsten carbide-tipped blades, though there is a variety of spare blades for special tasks, available in both steel (cheaper) and with tungsten carbide tips. Most saws have a riving knife – a crescent-shaped piece of steel which fol­lows the blade to guide the saw and to prevent the wood pinching in the blade, particularly when rip cutting. Although all circular saws have guards fitted, they can cause serious injury and need great care in use. Circular saws are particularly useful for sawing long lengths of timber up to 50mm thick and for cutting up man-made boards (plywood, chipboard and so on). But they cannot be used for cutting a curve with a small radius. They have an upward cutting action. As the blade cuts, the saw rests on its soleplate and the blade passes through a slot in this. The soleplate can be moved up and down to adjust the depth of cut and can often be tilted so that the blade cuts at an angle (45 degrees maximum). Nearly all circular saws come fitted with a rip guide which you attach to the soleplate to help you cut at a fixed dis­tance from the edge of the wood. Some are graduated (in millimeters), but it would be unwise to rely on this for com­plete accuracy. To ensure that you get an absolutely straight cut, a circular saw can be guided along a wooden batten clamped to the wood you are cutting (which should itself be well secured). Careful measurement will be needed to get this in the correct place. 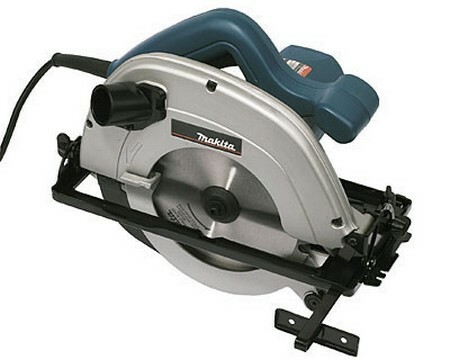 When using a circular saw do not try to push the saw through the wood too quickly – this will make the motor labor and overheat and the saw may eventually stall – though some have a slip-clutch to prevent this. Always use a sharp blade and let the blade reach full speed before starting the cut. You should also let it stop before attempting to remove it. Keep the cable well away from the cutting line – it’s best to drape it over your shoulder. If working outside with a circular saw (or any other power tool), make sure that the socket outlet you are connected to is pro­tected by a residual current device. Sensible clothing is important when using a circular saw: no loose sleeves or ties (and long hair tied back) plus safety goggles and, if necessary, a face mask and ear plugs. Some circular saws have provi­sion for a suction hose to be connected to the upper blade guard to get rid of saw­dust while cutting.